Good design always makes sense but Twitter’s new format is perplexing and makes no sense at all. Good design is powerful, it sells, it provides instant brand recognition. Nobody knows this better than APPLE. Good design goes into their product and logo and we appreciate that by buying their product in boatloads. 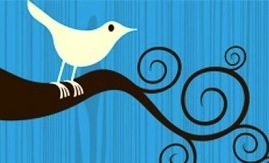 Twitter started off with a passable LOGO: an unusual, assertive little bird on a curly branch. Then it went through various iterations and eventually became a blue blob, barely recognisable as a bird. By the way, blue is considered a very passive color for a logo. After that, Twitter bios were published in illegible WHITE TYPE for no reason. And algorithms were changed so posting a pasted tweet and a link became more difficult. Now comes the new Twitter page with PROFILES illogically placed on the left when the reader’s eye naturally goes to the right. And what's on the right? “Who to follow”, something so irrelevant most people ignore it. Also, there’s a laughable 1500 X 500 pixels background space that is all but impossible to fill with a useful image. The wide, shallow size is so impractical that many people have simply opted for a blank color rather than try to squeeze something into it. The formerly easy-to read vertical LIST OF FOLLOWERS/ FOLLOWING is now a horizontal mess of photos and complete bios that is tiring and time-consuming to consult and entirely unnecessary. Internet users are impatient, if a site doesn’t look attractive and they can’t get around it quickly, they’re gone. Good design doesn’t complicate, it simplifies, it’s intuitive, easy to read and a pleasure to look at. The golden rule of good design is: FORM FOLLOWS FUNCTION. If we judge Twitter by its current design form, its function must be an illogical jumble. Poor design often indicates poor management. Twitter recently went public and is not doing spectacularly well on the stock market. User growth has also slowed. Is this design change a misguided effort to improve performance? Unfortunately, poor design will not improve sales or gain more users, on the contrary, it will alienate current users and discourage new ones. Twitter, please hire some top designers to simplify your site and make a good product better. Good design pays.